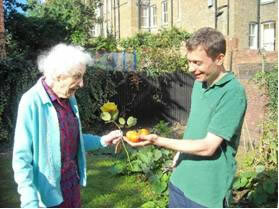 Age UK Wandsworth volunteer Federico Filippi has been named a ‘Garden Hero’ by the Capital Growth campaign for his work at Mount Court, a sheltered housing scheme in Putney. Federico is a volunteer with the Garden Partners scheme, run by AUW, which links older people with volunteer gardeners for gardening and growing together. Federico plans to spend his £250 prize on introducing bee-keeping at Mount Court, and can claim three free Capital Growth horticulture training sessions next year. Federico has been working since the spring to transform three garden areas at the sheltered housing scheme, growing organic vegetables, fruit and herbs for the benefit of residents. He has rekindled interest among tenants who thought their gardening days were over, but who are now joining in with growing and watering. Residents who have not tried gardening before are also getting involved. A new greenhouse, donated by the Prince’s Trust, will allow Federico and his ‘team’ to grow a wide range of seeds next year.